Soundmondo is a social sound sharing website that allows users to discover new sounds, share their own sounds and organize sounds. Originally released for the reface, Soundmondo has expanded with MONTAGE compatibility! Up to date MONTAGE OS Version: Your MONTAGE must be updated to OS Version 2.0 or later. Go here to get the latest MONTAGE OS Version (located under “Firmware/Software” as “MONTAGE Updater”). Google Chrome: To use Soundmondo you must use an up-to-date version of Google Chrome. Chrome uses a special connectivity protocol called WebMIDI that allows a hardware device like MONTAGE or reface to connect directly to the site via the browser. Get Chrome here if you don’t have it. 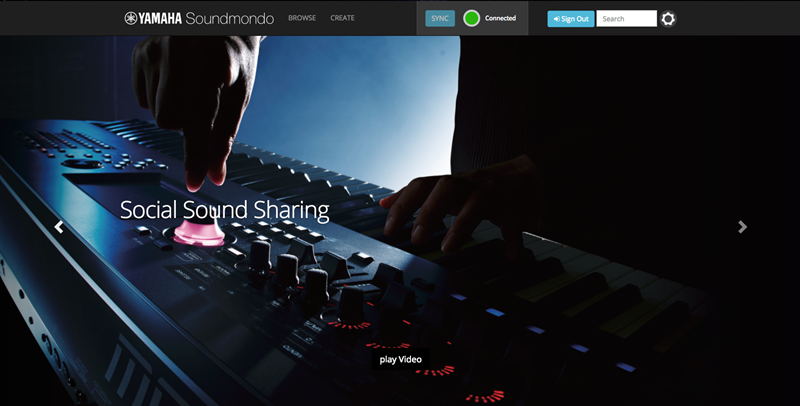 Let’s check out some of the cool things you can do with Soundmondo. DX7 Voice ROM: All of the original Voices from the DX7 ROM Cartridges are available on Soundmondo. Load them in MONTAGE and edit them to your design! HaPe’s Collection: This collection of sounds from the expert sound designer Hans-Peter Henkel is great and showcases the sonic power of MONTAGE. Richard Devine: Sixteen handcrafted Performances by electronic artist and sound designer Richard Devine. Want to see Richard use some of these Performances on stage? Go here! Want to check out my Performance? Go here! Sounds: This shows a list of all the sounds you have uploaded to Soundmondo. Trash: Take any unwanted sound and drag it to the trash! It’ll still be there until you click on “Empty Trash”. Set Lists: Organize your sounds in to set lists. Create a Set List then drag the sounds you want into the folder. Got an iOS device? Get the Soundmondo app! It features all the functionality you see here on iPhone, iPad or iPod Touch. All you need is a USB cable and the Apple Lightning to USB Camera Adaptor.